A family of Jewish financiers prominent in Turkey at the beginning of the nineteenth century. It is of Spanish origin, and probably came from the city of the same name in Andalusia. The earliest known member was Behor Carmona, or, more exactly, "Tchelebi" (Lord) Behor Carmona, who had the Turkish title "Shaptchi Bashi" (chief purveyor of alum). Carmona was at the same time banker to the court and general tax-gatherer, sharing these offices with two other Jews, Ezekiel Gabbaï and Isaiah Ajiman. In time of war Carmona and Gabbaï followed the armies, establishing themselves near headquarters. After the destruction of the corps of the janizaries, in 1826, by order of the sultan Maḥmud two negroes of the palace strangled Carmona one night in his own house. His property was confiscated. 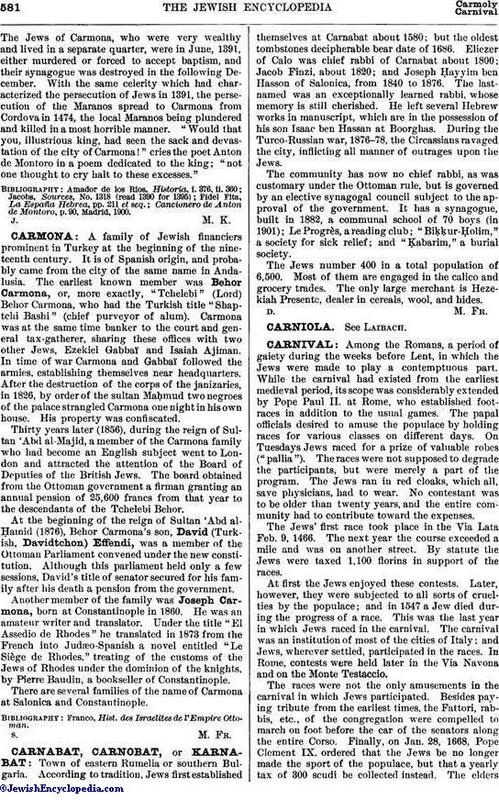 Thirty years later (1856), during the reign of Sultan 'Abd al-Majid, a member of the Carmona family who had become an English subject went to London and attracted the attention of the Board of Deputies of the British Jews. The board obtained from the Ottoman government a firman granting an annual pension of 25,600 francs from that year to the descendants of the Tchelebi Behor. At the beginning of the reign of Sultan 'Abd al-Ḥamid (1876), Behor Carmona's son, David (Turkish, Davidtchon) Effendi, was a member of the Ottoman Parliament convened under the new constitution. Although this parliament held only a few sessions, David's title of senator secured for his family after his death a pension from the government. Another member of the family was Joseph Carmona, born at Constantinople in 1860. He was an amateur writer and translator. Under the title "El Assedio de Rhodes" he translated in 1873 from the French into Judæo-Spanish a novel entitled "Le Siège de Rhodes," treating of the customs of the Jews of Rhodes under the dominion of the knights, by Pierre Baudin, a bookseller of Constantinople. There are several families of the name of Carmona at Salonica and Constantinople. Franco, Hist. des Israelites de l'Empire Ottoman.